Art gets started at Wild Goose Creative. We are an incubator for creative events — it’s where you go to be a part of the art. Wild Goose Creative is about a lot of things: sustainable partnerships and artistic collaborations. It’s about giving artists resources and facilitating their work. It’s about creating a space for people to experience art and engage each other, to tell stories and listen. It's about participating in the growing arts culture of Columbus, Ohio. Mostly, Wild Goose Creative is about helping to build a vibrant community of people who care about creativity. Our mission: To build a creative community at the intersection of art, risk and meaning. WGC is always looking for community leaders, volunteers, committee and board members. Drop us a line if you're interested in getting involved! Visit our events page to see the creative artistic projects and collaborations that call Wild Goose Creative home." Patrick often says, “I’m not an artist, but I love the arts.” He has spent his career supporting artists and is dedicated to fostering growth in the organizations that support them. Patrick is a native of Columbus and has been working in the non-profit sector for more than 17 years. He came to us after serving as the Executive Director of Columbus Gay Men’s Chorus. His volunteer experience in the arts is extensive and includes work as an Arts Day Committee Member for Ohio Citizens for the Arts Foundation and as Membership Co-Chair for Columbus Arts Marketing Association. Before joining Wild Goose Creative as Operations Coordinator in 2017, Lydia completed her Bachelor's in Arts Management from Ohio State University and Master's degree in Advanced Chinese Language and Culture at Peking University. Lydia has worked for internationally recognized galleries and museums in America and China, as well as completed two years of extensive research regarding cultural policy in Beijing. Our Board of Directors advocate for art in Columbus and guide the organization with their talents, time and pocketbooks. 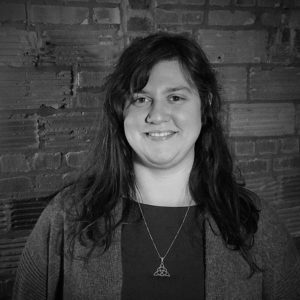 Heather Lynn Kyle is a graduate of Columbus College of Art and Design, with experience in galleries, non-profit and marketing. She is currently the Design Director for the Employee Experience team at JPMorgan Chase. Heather, a painter and performance artist, is the founder of Performance Art Day and has been spearheading Wild Art Columbus, our biannual fundraiser, for the past few years. Jessie Glover Boettcher is a collaborative theatre artist, teacher, and advocate for the arts. She is the founder and lead facilitator for the Ohio Prison Arts Connection, a coalition that brings people and art together inside and outside of prisons. She teaches theatre and arts administration at Otterbein University and Ohio State University, and leads Theatre of Conviction, a company of men making theatre at Marion Correctional Institution. Along with several wonderful friends and artists, she co-founded Wild Goose Creative in 2006 and has served on the board of directors to build programs and oversee the organization ever since. She holds a PhD from the University of Minnesota and lives with her husband Karl and two great kids, Max and Amos. Loke Shao Xun is a driven business professional and pathblazer. He is working on PatronArt.com, an online art marketplace that helps independent artists sell their artwork and services. Via this vehicle, he hopes to bring the global art ecosystem into the 21st century. His mission is to create value for society by promoting fine art and to provide an avenue for art practitioners to live with dignity. Loke believes in sincere interactions, and that the hard times naturally herald the good. His family is based in Singapore and London, and he lives and works in Columbus Ohio on an E2 Treaty Investor Visa. Michael J. Morris is choreographer, performer, writer, yoga teacher, and Visiting Assistant Professor at Denison University where they teach in the Department of Dance, Queer Studies, and Women’s and Gender Studies. Michael’s writing has been published in The Oxford Handbook of Dance and Theater and a number of academic journals, and they regularly present research at conferences in dance and performance studies, queer studies, and transgender communities. Michael holds a PhD in Dance Studies from The Ohio State University. Erin Aluise is an artist from Columbus, Ohio. She lived in Phoenix and enjoyed working at the Tempe Center for the Arts before returning to her hometown. Large-scale fiber and outdoor sculpture are her preferred modes of expression. Many works take on organic shapes with vibrant colors and textures. Currently working with acrylic, charcoal, and performance in addition to her sculptural work. She is developing a database for artists and makers. Her hope is to create a usable interface that will help keep artists organized and become business conscious. Erin received her BFA in Sculpture from Ohio University and her Office Specialist Certification from CSCC. Jessie received her Master’s Degree in Arts Policy and Administration from The Ohio State University in 2016. Currently, she is the Assistant Director for Alumni and Constituent Engagement for The Ohio State University College of Medicine. She is also the author of the blog Creativity in the City. She is a pianist, lifelong lover of the arts, and a passionate advocate for arts education and access to the arts for all members of the community. Barbara Allen is the Co-Founder of Columbus Unscripted, Director of The Columbus Improv Festival, founding member of Sassy Do! Improv, and Stand Up for Stand Up and Co-Director of Educational Initiatives. She celebrates the practical applications between improvisation and leadership working most recently with The Columbus Blue Jackets, The Child Development Council of Franklin County, The Praxis Communities of Southern Ohio, The Theatre Roundtable of Columbus, The State of Ohio Training Association (SOTA), The International Association of Business Communicators (IABC), The United Way of Central Ohio Neighborhood Leadership Academy, Ohio Dominican University and The Ohio State University. Charlene has held the position of Project Coordinator with The STEAM Factory at The Ohio State University since June 2014. During her time with STEAM, Charlene has worked with a widely diverse group of academics, scholars, community members and business partners on a variety of innovative programs and activities aimed at sharing the knowledge and expertise throughout the University and Columbus community. In this role, Charlene spends the vast majority of her time on the strategy, planning, programming and implementation of organizational activities that foster interdisciplinary conversations, research opportunities and innovative programming. The Wild Goose Creative Advisory Board meets twice yearly and provides valuable feedback to the Board of Directors and represent Wild Goose Creative in the community.